So long has the electric vehicle been considered as only a town car that its worth for country tours has been greatly underestimated. In California, the land of sunshine and flowers, cross-country tours by electric vehicles, especially in such cities as Pasadena and Los Angeles, have long been in popular favor. Motorists all over are finding California’s lure unusually strong during 1916. The famous good roads throughout the length and breadth of the state have proved a paradise for the electric motorist, and the additional rewards and attractions provided by the Panama California International Exposition at San Diego are influencing hundreds of spring travelers. As a part of the Exposition’s motor demonstration field where daily tests and special events were inaugurated May 20, a bronze button is being given every automobile driver who travels more than 500 miles to the Exposition. One Exposition entrance is open to automobile drivers at a nominal admission, and free parking space for the electrics is provided on the grounds. The Beardsley Electric Company, of Los Angeles, has successfully staged a number of runs, a recent one being from Los Angeles to Riverside and return. On Saturday, April 15, thirty-five Beardsley electrics, possibly the largest gathering of one make of electrics ever assembled for a tour, left from the salesrooms of the Beardsley Electric Company for a run to Long Beach. These cars, driven by their owners, and accompanied by over one hundred guests, merrily spun over rolling hills and out beyond, on the broad county highways for which Southern California is so justly famous; through the rich agricultural section whose products are known in every land; past walnut orchards, orange groves, dairy farms and alfalfa fields, and on roadways lined with blooming roses reflecting the radiant touch of nature’s master-hand, and down to the towering bluffs upon which has grown the beautiful city of Long Beach, overlooking a broad expanse of the quiet Pacific. Here a banquet was served at the Hotel Virginia to the guests by Volney Beardsley, after which a dip in the briny deep was indulged in by young and old alike. 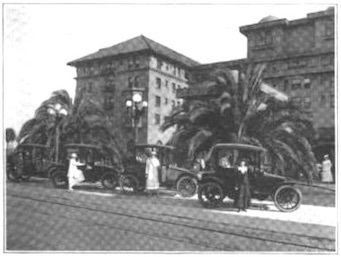 Beardsley Light Electric at Hotel Virginia, Long Beach. Much interest was manifested in a new model Beardsley known as the light town car, perhaps the lowest priced electric built in America, selling for $1,285. It was predicted by the builders that this economical car would be able to maintain its position along with its larger brothers and sisters and it fully lived up to all the claims made for it. Each car averaged over 70 miles on the trip, and from the fact that they were driven by owners, many of whom could boast of more than three-score years and of whom over two-thirds were ladies, it can no longer be doubted that the electric vehicle has become a unique factor in the enjoyment and pleasures of those who desire comfort and ease of operation, combined with sturdiness and road qualities. The party left Long Beach at four o’clock and the return trip was made in under two hours and all of the members of the party reached home in ample time for dinner. Not a single mishap occurred and every car finished the run on its own power. Such tours as this are but forerunners of many that are planned for the coming summer, and it is prophesied by the native sons that the California builders of electrics will again set a record that the eastern manufacturers will have difficulty in beating. Electric pleasure car owners in New York City had a day of their own on May 19 when the New York Electric Vehicle Association’s “sociability run” took place. The run was planned with the object of encouraging sociability among the hundred or more women drivers of electric automobiles in New York and of demonstrating the practicability of the electric car for long runs. The start was made at 2:30 p. m., from the Electric Garage, Central Park West and Sixty-second street, the cars then proceeding up Riverside Drive through Van Cortlandt Park and Westchester to the Siwanoy Country Club, Bronxville. Invitations were sent by the New York Electric Vehicle Association to all owners of electric pleasure cars in Manhattan and the Bronx. One of the features of the run was a competition in the form of a secret time contest. The distance covered was approximately forty miles. Three judges made the run in their own cars before the day of the contest, each one noting the total time in which he made the run. The average of these records was obtained and was used as the secret time for the run. The contestant coming nearest to driving the car over the route in the secret time was awarded a prize. All that the contestants had to gauge their time by was the approximate speed in miles per hour which they were told to make. With forty-two cars competing, the Sociability Run and secret time contest for electric pleasure automobiles, held under the auspices of the New York Electric Vehicle Association, on May 19, was pronounced by all those who participated a decidedly enjoyable and successful event, as stated in the June ELECTRIC VEHICLES. The day was ideal for the run, which was from the Electric Garage at Central Park West and 62nd street, where the photographer caught a group of cars in the rear of the Century Theatre in front of the Electric Garage and the Detroit Electric service station, which adjoins it to Riverside Drive Van Cortlandt Park and then to the Siwanoy Club in Bronxville, a distance of 19 miles. The cars left the garage between 2:30 and 3 o’clock until the forty two were gone being driven by their pilots over a previously outlined course to the Siwanoy Club where they arrived safely between 4 and 4 30. Only ladies were entered in the secret time contest, which consisted of an attempt on the part of the contestants to cover the course, as nearly as possible, in a previously determined secret time. The prize was won by Mrs. W. H. Jacobus, of 790 Riverside Drive, who drove her brougham, in which were her daughter and a friend, over the course in one hour and 24 minutes, the secret time being one hour, 23 minutes and 30 seconds. At the Siwanoy Club, Mrs. Walter Neumuller, the hostess, poured tea. The average running time for all cars over the course was one hour, 23 minutes and 20 seconds, and the various makes entered were Baker, Rauch and Lang, Detroit, and Milburn. Mrs. Olivia W. Smith, the chaperone of the New York Electric Vehicle Association, who had charge of the run, deserves the fullest credit for the admirable manner in which she conducted her part. The association was so well pleased with its first undertaking that it has planned a similar run for the coming fall months. Among the cars entered were those of Mrs. E. L. Benedict, Mrs. Martin Carey, Mrs. Moses Dillon, Miss. L. L. Dodds, Mrs. Paul Gerli, Miss. I. M. Gibson, Mrs. M. P. Graham, Mrs. R. F. Greene, Mrs. Anton Hilbert, Mrs. George L. Hunter, Mrs. W. H. McAuliffe, Mrs. M. Mintzer, Mrs. Walter Neumuller, Mrs. John Reno, Mrs. J. Rode, Mrs. Otto Roethlisberger, Mrs. Florence Sonn, Mrs. Sidney W. Stern, Mrs. I. M. Taussig, and Mrs. Margaret Maynard, also Dr. Howard Gillespie Myers, Dr. Ward Hoag, and Capt. C. R. De Aquino.